KeepCup is a reusable cup that you can use for coffee, tea or any drink, either at home or on the go. Its easy to use, easy to clean, its also leak proof and has an easy pour spout. Around 5 million people around the world already use a KeepCup, diverting millions of disposable cups daily from landfill and through their actions, inspire others to do the same. Join the revolution, get a reusable KeepCup, water bottle and shopping bag and start making a daily difference. 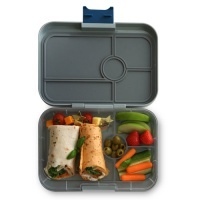 The Perfect Way To Eat On The Go For Adults and Older Kids. Yumbox's unique slid seals all food wells individually. Ideal for Salads & Sandwiches.